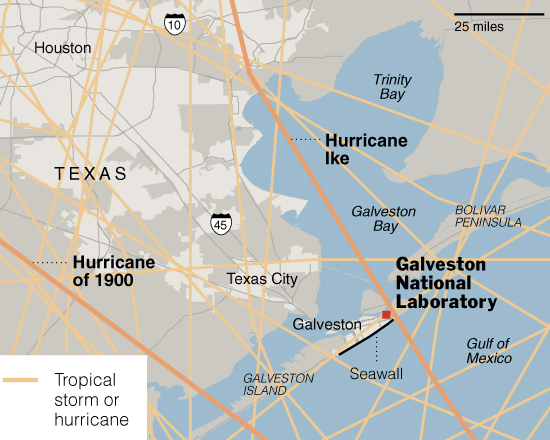 If that isn't fascinating enough, the lab's “gleaming new building” happens to be located in one of the most unstable types of landform and where hurricanes regularly make a mess of things: the barrier island of Galveston, Texas. A gleaming biological bunker, as impenetrable and monolithic as CIA HQ, a Pandora Box protruding out in a landscape of ruins and shifting sands. Perhaps the next lab will be on an oil rig? Right. Let people know that it's a safe haven from hurricanes, and they'll break into the place next time we have a Katrina. They'll end up getting infected by the supergerms, and then we have a disaster on our hands. Now that's good site selection. "Where should we house the lab for all the dangerous biological experiments?" "Let's put it on an island in the midst of hurricanes' paths." Excellent idea. Is Jake Gyllenhaal here yet? Roll the cameras.